Humphrey Bogart was an American movie actor who had three Oscar nominations for Best Actor of which he won one. In 1999 the American Film Institute named Humphrey Bogart as the greatest male star in Hollywood history. He was born Humphrey DeForest Bogart on Christmas Day 1899 in New York City. His parents were Dr. Belmont DeForest Bogart and Maud Humphrey. The birthdate of Humphrey Bogart has sometimes been disputed. There have been claims that the Christmas birthday was made up by Warner Bros. studio as a publicity stunt. The claim is that his real birthdate is actually 23 January 1899. However a birth notice in a New York newspaper and the 1900 census both support the December 1899 date. 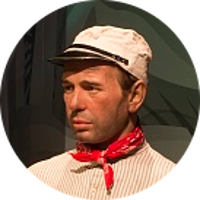 In 1952 Humphrey Bogart received the Oscar for Best Actor for his role in the movie African Queen. Ironically Humphrey Bogart and his co-star Katherine Hepburn, who was nominated for Best Actress for her role, were 7th cousins through their common ancestor of Joseph Morgan. Other notable celebrities with kinship to Humphrey Bogart are Lucille Ball, Clint Eastwood, Glenn Close and Brooke Shields. He has royal family connections with Princess Diana, Prince William, and Prince George. Presidential kin include Millard Fillmore, Ulysses S. Grant, Franklin D. Roosevelt and a number of others.